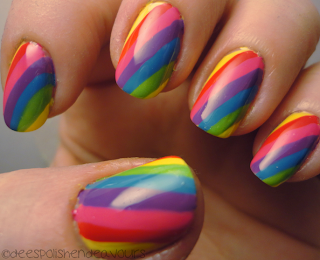 Awe yeah, rainbow nails, YEAH! I am actually going to be a little bit sad to have to remove this.. I really like the colours I chose to use and just the overall effect. Why don't I do rainbow nails more often? I guess I will now! I used: Orly Spark, Essie Silken Cord, CG Rich & Famous, CG Spontaneous, OPI No Room For The Blues and CG Entourage. wow, that's pretty. I love rainbows! What great rainbows--they make me happy just looking at your photo! Yay! I am glad these nails made everyone as happy as they made me! I think I am going to be sporting them again very soon.. There is just something about rainbow nails that make you smile!! Best rainbow ever! It's so pretty!